Foxhall Catering is an event catering company specializing in small and large scale events in the Washington D.C., Maryland, and Northern Virginia areas. We cater dinner parties, cocktail parties, weddings, bar mitzvah and bat mitzvahs, galas and fund raisers. We offer individualized/personalized menus for each of our clients. Each proposal is personally tailored to reflect the concept of your event. Foxhall Catering is boutique catering in Northwest DC. Family owned and operated, Foxhall Catering has one mission—to bring to your home or event venue the finest culinary experience available anywhere. We are not the biggest caterer in DC and don't ever want to be. We are as selective in choosing clients as you are in choosing a caterer. We know what it takes to make an intimate gathering in your own home or a festive celebration at an event venue an unqualified success, and we carefully match your interests and aspirations to our restaurant-quality offerings. Chef Eron adds a modern flair to traditional techniques. Classically trained in French cuisine at the Culinary Institute of America in New York, Chef Eron believes in letting the natural flavors of the best food ingredients stand on their own. His approach to food is the same as his approach to life—personal, committed and enthusiastic. Chef Eron is "All in" with every dish and every event. After two decades working in some of the finest restaurants and resorts in New York, Massachusetts, Maryland and D.C., Chef Eron is all about bringing a top-end restaurant experience into your home or to your event venue. Chef Eron's interest in food is constantly evolving, guaranteeing that your event will be a cutting edge culinary experience. Chef Sarah was born baking. She learned to mix and measure when other children were learning to talk. Baking for her is like breathing and it shows in each of her sweet creations. For Sarah, baking is where love and passion for food intersects science and mathematics. Precise, studied and inspired. Your aesthetic of dessert—flavor, texture and mood—guides Sarah in her design of unique creative delicacies for your event. 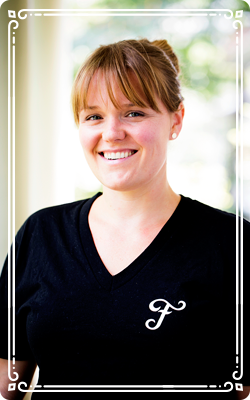 She works with each client individually to find the perfect Foxhall finish for your catered event. Quality Control Chef Nora Rose is Foxhall Catering's premier epicure. Following in the footsteps of her mom, Pastry Chef Sarah, and her dad, Chef Eron though cultivating her own culinary sensibilities at an even earlier age than either chef-parent. Nora developed her discerning trademark up-or-down no-nonsense accept-reject food quality call-outs by three-months, began "sniff-testing" rosemary and lavender at six months, cut her teeth pitting kalamata, castelvetrano and niçoise olives, and developed Foxhall's unique in-house 4-star food quality rating system: "more," "more-more," "more-more-more," and "more-more-more-more."